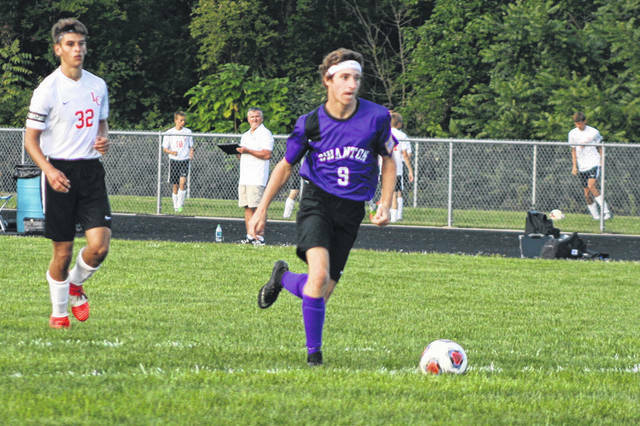 Zach Schaller of Swanton on his way to scoring the team’s final goal Thursday versus Liberty Center in NWOAL boys soccer action. He had two of the Bulldogs’ three goals. Riley Hensley of Swanton takes control of the ball Thursday against Liberty Center. The Bulldogs fell by a final of 6-3. 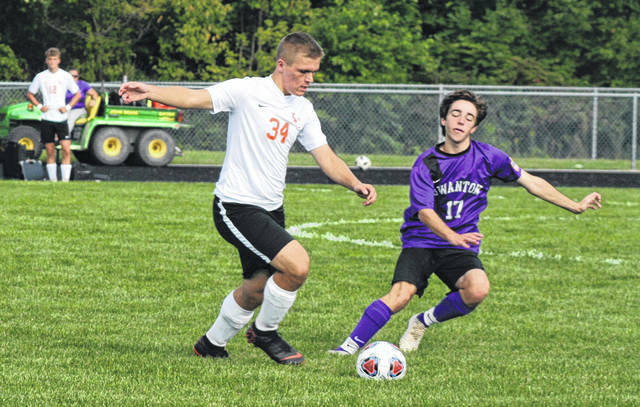 Cole Mortemore of Swanton defends Adam Wells of Liberty Center (34) during Thursday’s league match. 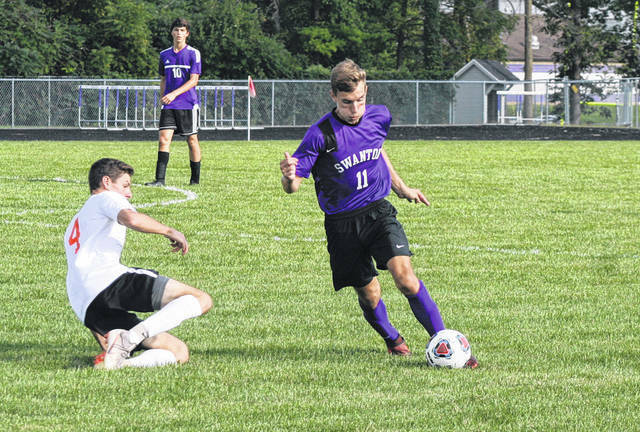 Swanton could not overcome an early flurry from Liberty Center that saw the Tigers score four goals in the first 18 minutes Thursday in Northwest Ohio Athletic League boys soccer. The Tigers ended up with a 6-3 win. LC tallied their first goal just 1:26 into the contest. They went up 2-0 at the 36 minute mark on Jacob Hoffman’s shot from the left side. He banged it home after Swanton’s goalkeeper, Ethan Branum, fell down stopping an initial shot. Then with 27:34 to go, Liberty Center’s Tanner Reimund snuck a high shot over Branum from roughly 25 yards out for a 3-0 Tiger lead. Alex Starkey finished off a left to right crossing pass with 22:38 left in the opening half to make it 4-0. Swanton did not dent the scoreboard until the second half. Zach Schaller put in a penalty kick just under four minutes into the half, trimming the Tiger lead. However, LC got the Bulldog defense out of position and Zach Skeens scored to push the lead back to 5-1 at the 32:39 mark. Swanton’s Cole Mortemore found the back of the net on a long shot with 24:59 left in the contest. His goal from 25 yards out got them back within 5-2. Each team added a goal in the final 17 minutes to reach the final tally. For the Tigers, Parker Strauss headed one in over the Bulldog keeper. Schaller was able to get around an LC defender to score Swanton’s final goal. Swanton’s next league match is Tuesday, Sept. 11 at Archbold beginning at 7 p.m.